The OBD standard (On Board Diagnostic) was implemented initially by the CARB (Californian Air Resources Board) to control polluting emissions from vehicles. The arrival of electronic computers to manage the engine and associated computers enabled vehicles to reduce their pollutants. The OBD states that a vehicle should permanently monitor the smooth operation of the engine throughout its life. OBD or OBDI standardises the connector so that it is identical on all vehicles. The communication protocol remains more or less specific depending on the make. OBDII arrived in the United States in 1996 to specify common protocols. EOBD for European OBD based on OBDII is specific to European vehicles. EOBD was implemented in Europe at the same time as the EURO3 standard for pollutants from vehicles. It states that emission failures must be signalled by means of an indicator on the dashboard and that the codes corresponding to the detected failures must be recorded by the vehicle. Some vehicles not covered by the directive may nevertheless be compatible. It depends on how much manufacturers are in advance of the new directive and their willingness to implement the standard. PS: It should be noted that commercial and company vehicles are also affected by this directive, but their application dates are different (2006/2007). Euro 3 and its directive announced the arrival of a new indicator on vehicle dashboards. The MIL for "Malfunction Indicator Lamp" is an icon representing an engine unit in orange/yellow (red is prohibited) specified by ISO 2575. Opposite are some examples on various vehicle models. Flashing : a fault that may cause the destruction of some vehicle devices has been detected. In this case, it is strongly recommended to stop the vehicle at the earliest opportunity. Usually this mode also means the vehicle switches to failsafe mode (engine speed and power are limited). Intermittent : a fault has been detected but the system has not confirmed the presence of the fault. The indicator switches off by itself. Off : In this case, no fault linked to pollution is active. This does not necessarily mean that a fault is not present. Some of them have very little affect on the operation of the vehicle for example a malfunction in the glow plugs as described in our case study. 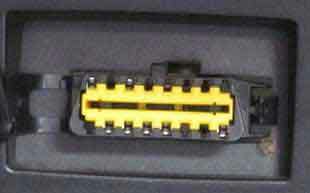 The directive states that the connector must be placed inside the passenger compartment. Usually it is located under the steering wheel in the fuse box or under the ashtray near the handbrake. If you cannot find your diagnostic connector, go to our page location of OBD connectors to help you locate it. PS: It should be noted that the remaining pins may be used by the manufacturer as needed. Quero tirar uma dúvida o obdll/e obd só diagnostica o sistema demolição ou ele diagnostica todo o sistema de injeção? Thank you this arrival has been very helpful .